At just 120.1 inches long, the Scion iQ is the second shortest mass-produced car available in the U.S. The ForTwo bests it by 14 inches, bumper to bumper. The Scion iQ is tiny. The iQ matches a 1.3-liter four-cylinder to a continuously variable transmission (CVT) for reasonably peppy acceleration for a car intended to live in urban environments. Snappy accelerator response and a CVT that ramps-up quickly makes getting going a breaze but the car does lack power at full bore. The suspension rides comfortably over potholes and other urban terrain and the steering is accurate and gives decent feedback. The iQ drives best in slow urban settings. Parking the iQ is a dream. The vehicle manages to turn in a scant 25.8-foot circle, allowing U-turns in just about anything two-car-garage-sized or larger. Beyond slow speeds the cars handling struggles. The car leans hard in corners and any bumps or rough spots in a corner will send the car skipping sideways in a hurry. The brake pedal feels lifeless for much of its pedal travel and under hard braking the rear tends to get squirrely. The iQ simply is not designed to travel on the highway, hence the lack of availability of a cruise control system in the vehicle. The iQ moans and whines when asked to achieve or hold highway speeds and the car’s twitchy steering and jittery suspension further degrade its highway composure. The iQ does, however, manage to achieve a 36/37 mpg city/highway EPA rating, numbers more along the lines of a hybrid than a traditional car. 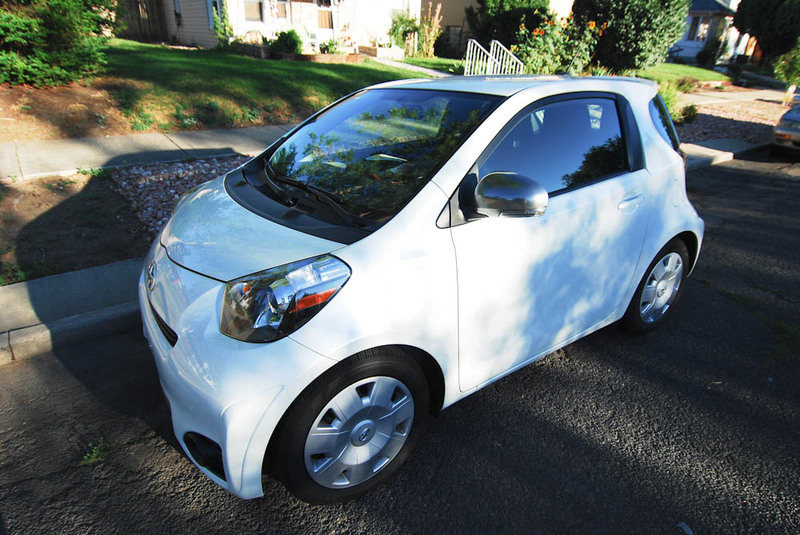 The iQ’s combined 37 mpg rating beats all non-hybrids, including the ForTwo. Inside the Scion iQ are good quality materials and finishes, with other niceties including automatic power windows, piano-black and pearl-white accents and padding on the doors for your arms and elbows. However, I found the iQ’s seats to have unsupportive cushioning and to be lacking in lumbar support. In a corner you’ll find yourself sliding around and the problem is compounded by the fact that there is no center armrest. The seating also lacks height adjustment. Despite its lacking rear seating, the iQ does offer plenty of room for the driver. There is ample legroom for the driver and front passenger — thanks to the lack of a glove compartment. Scion calls it “three plus one” seating. As in the front passenger legroom allows them to move their seat forward enough to allow a rear passenger in. It works, but it isn’t magnificently comfortable. The “plus one”, hilariously, implies that someone could actually fit behind the driver. Not happening. Unless your driver is the world’s shortest man and the passenger behind him is his female counterpart. With the rear-seating up you also reduce trunk space to a scant rectangular space capable of maybe carrying two six-packs. More specifically cargo room amounts to just 3.5 cubic feet behind the rear seats. Fold them down and you get 16.7 cubic feet, equivalent to a midsize sedan. For such a tiny car, you would expect visibility to be excellent. Not so. With the rear seats in the up position their massive head restraints bite a chunk out of the rear view, dropping the seats makes a huge difference. Unfortunately, the massive B-pillars cannot be dropped and impede visibility over the left shoulder. The iQ has 11 standard airbags, including seat-cushion airbags that keep front passengers from sliding under their seat belts. Despite the ample supply of bags, the iQ only received four out of five stars in National Highway Traffic Safety Administration crash tests. Protection for the front passengers was rated three stars. The Scion iQ will make you a parallel parking champ. My iQ started at $15,265 and after a long list of extras rang in at a grand total of $19,355. Similar money buys a well-equipped Kia Soul or Ford Fiesta, or even the Honda Fit all of which have real backseats and better composure on the road. Fun and well appointed styling, urban-friendly dimensions and incredible gas economy in the city will certainly lead many to the iQ and compared to the Smart it’s a fantastic little urban ride, but outside of the strictly urban setting the cars appeal falls fast.